Welcome to CEA’s Fall 2019 family group! If you have a student studying abroad with CEA during the Fall 2019 semester, this is your hub for all things pre-departure, from visas to safety abroad and what to expect. Click the links below to select the location where your student is studying abroad and request to join the group! CEA 101: A Study Abroad Overview: Link to recording and RSVP for live Q&A will be sent to you by email shortly. CEA 102: Your Students Health and Safety: Link to recording and RSVP for live Q&A will be sent to you by email shortly. 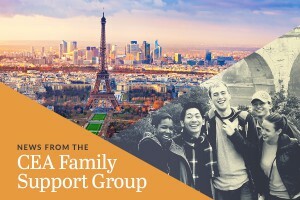 Visit this page anytime to reference pre-departure tips as your family prepares for Fall 2019 study abroad! Ask Your Student: They may have already received the answer from their CEA Site Specialist, or can look it up in their MyCEA account. Contact Your Site Specialist: Your team of CEA Site Specialist experts are here to answer your family’s pre-departure questions.